Do you find yourself getting depressed during the late fall/winter months? Losing the motivation and energy you usually have, staying home and not wanting to be very social? Change in sleeping patterns? Appetite changes? 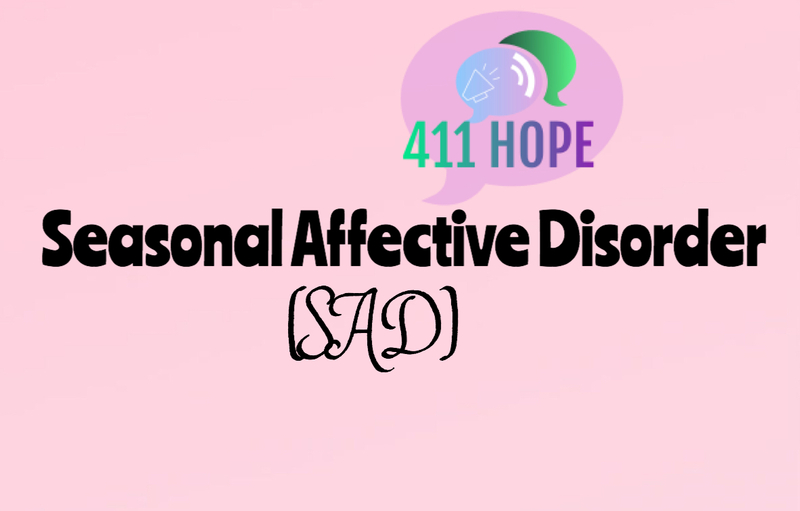 Than you may have Seasonal Affective Disorder, also known as SAD. There are different ways you can get yourself help if you feel that you may be suffering from SAD. You can look into local therapy options, can speak to your doctor about your symptoms and they may prescribe medications for you, you can also look into self help, which is what we will get into. Spend time outside during the day - even if you just go for a 30 minute - 1 hour walk every day. Keep curtains open during the day - this is to allow some form of natural lighting to flow inside since there may not be much sunshine. The best places to spend your time in, are the places where you can get some natural light, so anywhere where you may have a large window, or a room where it is nice and bright. Make sure you get yourself into a healthy sleep schedule! Even if you decide that you want to try and be sleeping by 11 pm. So you choose to go into bed at 10 and use an hour to relax yourself whether that is by surfing social media, or maybe taking that hour to listen to music or read a book etc. You decide that once 11 hits, you are going to out everything away, and try to sleep. Don't give up if you are having troubles sleeping at first. Make this schedule a habit and eventually once 11 comes, you will be ready to sleep. Don't be afraid to take time to yourself any time during the day when you can. Maybe you are going to make hot chocolate and watch a funny movie, or maybe you are going to relax in a bath for a bit with some bubbly bubble bath or bath bomb! Keep yourself in a steady daily routine the best you can. Waking up the same time each day, going to bed the same time, eating meals at the same time, exercise at certain times etc. Obviously daily schedules, sometimes we have to work, so it can't be exact all the time but we can figure out what works. If you have to wake up at 7 am for work, well, you don't want to wake up at 7 on days you have off. So instead, on days off give yourself until 9 or 10 am to sleep. Wake up, and even if you don't get up right away, you could sit up in bed, maybe read a book or play some music, and just take extra time to feel awake. Then you can get up and make breakfast, which could be toast, oatmeal, eggs, pancakes, etc. Breakfast is the most important meal of the day, so don't skip it!! Lack of motivating to give yourself basic caring needs.